A few weeks after the Israeli prime minister accused Hamas of piling up "telegenically-dead Palestinians for their cause," Benjamin Netanyahu has found a telegenically-dead victim for his propaganda purposes: James Foley, the brave American journalist killed by ISIS in Syria. Netanyahu is using Foley's gruesome beheading to equate ISIS and all its horrors to... Hamas. Yesterday he issued this video statement about Foley in English -- obviously tailored for Americans -- in which he denounced the "barbarism, the savagery" of ISIS. "We face the same savagery," Netanyahu said -- from Hamas. Later he tweeted that ISIS and Hamas are "Two branches of the same poison tree," and cited the oppression of women, Christians and gays as a shared program. "Hamas is ISIS. 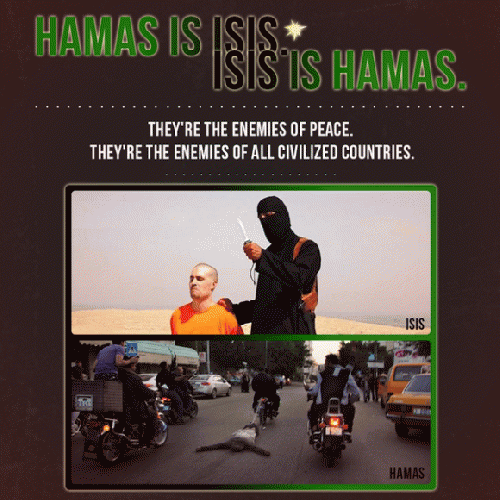 ISIS is Hamas. They're enemies of Peace. They're enemies of all civilized countries." -- Steve Israel (@RepSteveIsrael) August 20, 2014"
But many journalists have been roaming around Gaza without being arrested by Hamas. No, they get invited into people's homes, as Max Blumenthal has reported. Scott Roth points out Steve Israel's party importance. He's chair of the Democratic Congressional Campaign Committee (DCCC), "the official campaign arm of the Democrats in the House." And I wonder why my congressman, in his first term, has had nothing but joyful support for Israel throughout its massacre. I'm sure he's buddies with Steve Israel. He has to be, if he wants campaign funds to get reelected.